Samet Nangshe Viewpoint - Wow! There are lots of great views around the Phuket area (see Hills and Viewpoints for more). 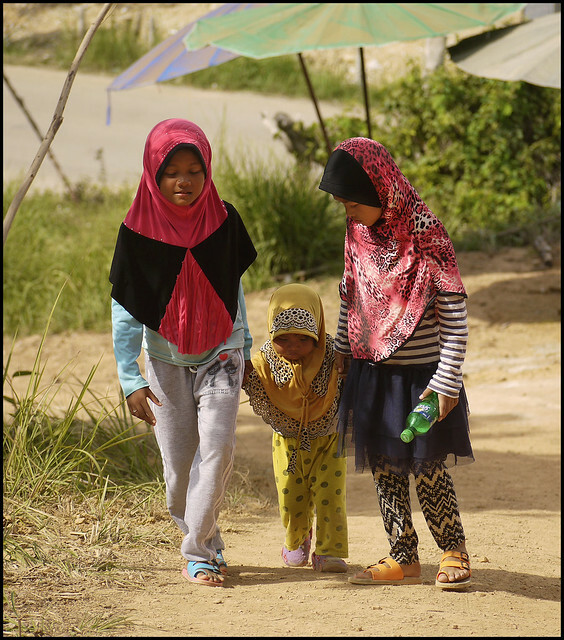 We have a mix of hills and ocean here (the name "Phuket" comes from the Malay word Bukit which means Hill), and if you climb a hill you can get some great sea views. The highest hills in Phuket are over 500m above sea level, but just a few kilometres from the sea. I do like finding new viewpoints, and earlier this year, I saw an amazing view on Instagram, posted by a Thai photographer. I could see that it was in Phang Nga, just north of Phuket island, and I recognised one of the small islands in the view, as I'd taken a photo of the same island in 2015 while exploring a corner of Phang Nga province that we'd never looked at before. So I figured the photo must be taken from a hill in that general location. 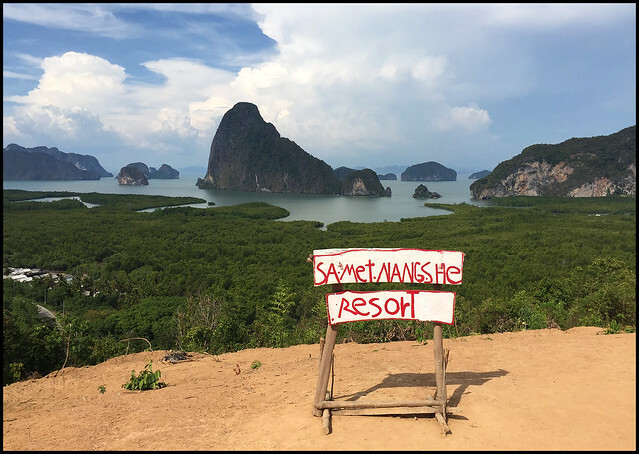 Over the last few months I have seen many more photos taken from the same viewpoint, and some showed a sign saying "Samet Nangshe Resort". Really? A resort? We'd just been there 6 months earlier and I'd not seen any resorts under construction. Well, this had to be checked out! 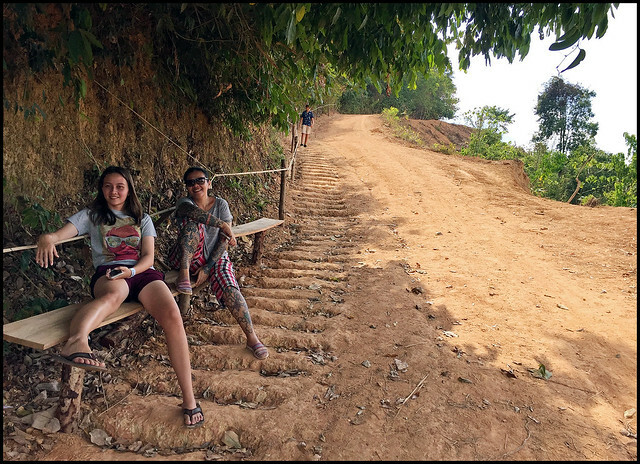 We drove over the Sarasin bridge into Phang Nga province and took the same road as before towards the small village of Klong Kian and then started looking for the viewpoint. We saw several signs saying Samet Nangshe, so we quickly realised this place was being promoted a bit, at least locally because I'd not seen any photos taken by foreign tourists, only Thai people. I was expecting a tiny sign and a little dirt road which our (not 4WD) truck might struggle to climb, but we soon found what we came for and were surprised to find it looking quite busy. A large carpark off the road and quite a few little stalls selling drinks and snacks. And there were several cars already parked there. Looks like a local landowner has decided to make some cash from the view! You don't see any view from road level. A dirt trail, which is wide enough for a car (but we only saw people walking), snaked up the hillside. It was a hot afternoon so we bought some bottled water and then paid a 30 Baht "entry fee" (no extra charge for the foreign guy) at a bamboo kiosk at the bottom of the path. It only took a minute of walking uphill to see the view. Ah! So there is the "resort" sign I had seen on Instagram! And certainly no sign of any resort or hotel here. That is quite a view. Phang Nga Bay is full of small islands, we have done many trips in the area by boat, but it all looks different from up high. I would like to take a helicopter flight over this area, that would be amazing. My family were quite content to see the view from here, but ... just before reaching this viewpoint the path splits and a sign points the other way and says it's only 200m to a higher viewpoint. We could see this higher viewpoint from where we stood. I'm going for it! Anyone else? Just me? Sure it was a bit hot walking up, but nothing serious. So I left the family and headed up. Not too tough really, only another 10 minutes, but it was steep and I was breathing hard near the top - it was a very hot afternoon! But, wow. Sometimes you do get these WOW moments. No matter what photos you have seen, or how much traveling you have done before. Wow! View from the top .. and there is no way a single photo can capture the full view. I realised this already, as I had seen photos, but the reality is more. And this is the start. We'll come here again, because the view is looking east. And the photos I saw of the sunrise were spectacular. I want to see that sunrise. Phang Nga Bay is a beautiful place. 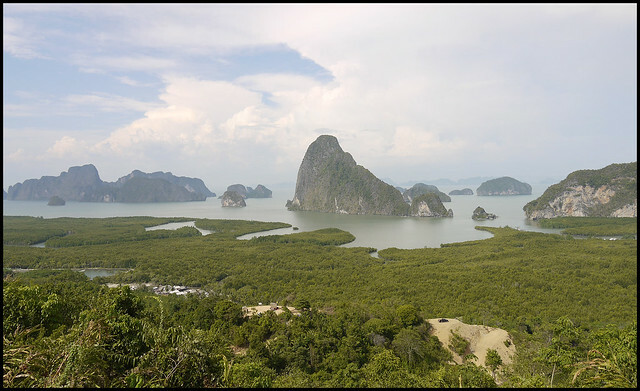 (above) And looking slightly more to the north across Phang Nga Bay. Wow. One more wow! The view here was fantastic. No way to show everything with one photo, and even though I had seen photos, the real life view was a fantastic thing to see. Nice to know that I can still be impressed by our local scenery. We will return! To get here in time for sunrise we'll have to leave home about 5am. I think an early morning will be very much worth the effort. 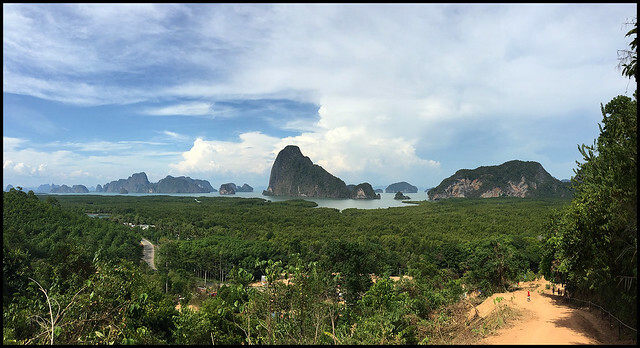 Of course we said the same thing about Khao Kai Nui viewpoint (also in Phang Nga) that we visited 4 months ago. The Monks are not naturally early risers! You have been reading ... Samet Nangshe Viewpoint - Wow!